Simply Groups tours are tailor-made for each group’s exact requirements. Our tours feature, quality accommodation, executive coaches, free places, guided tours for private groups, clubs and associations, group travel in the UK and Europe, DMC for Incoming Overseas groups, Corporate and Incentive travel. Every group tour is tailor-made for each group’s exact requirements. As the Group Organiser we want you to enjoy the holiday as much as your group members. In order to do this there will be regular contact and communication with you during all stages of your tour arrangements. Whilst away, relax in the knowledge that you are in expert hands. Accommodation will be suggested to suit your Group’s needs and budget. Many factors will be taken into consideration to enable us to select suitable accommodation. We work with many group types on a daily basis and know how important single room availability is. We also appreciate that supplements can increase the overall cost of a holiday for the single traveller quite substantially. With this in mind, we negotiate with hotels to keep the supplement as low as possible so as not to penalise solo clients and our aim is 'not to be beaten on price'. Executive coaches from pick up points of your choice in the UK. 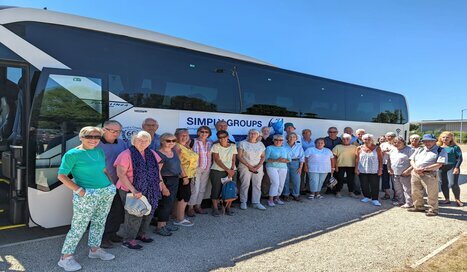 Coach drivers are more than a driver on our tours; they will assist in every way possible to ensure your group has an enjoyable holiday, assisting the Group Organiser where required. Working closely with the Group Organiser we provide a sample daily itinerary, suggesting a variety of suitable excursions which are usually included within our package price. The visits you choose to include are then arranged by us in advance of the tour departure, ensuring availability for the required date and time. Most places which have cultural, historic or artistic interest offer tours. Where stated or requested in advance, we will reserve a professional guide who is experienced within a particular area/site. To provide protection for all money our customers send us, we operate a ‘client trust account’ which is overseen by independent trustees. This money is ring-fenced and in the unlikely event of the company failure, the money held in this account would be administered by the trustees and returned to the group organiser to be distributed to their group. Simply Groups do not have access to this money until the return of the tour except in exceptional pre-agreed circumstances, protecting fully your payments and ensuring we operate within the strict EU regulations.